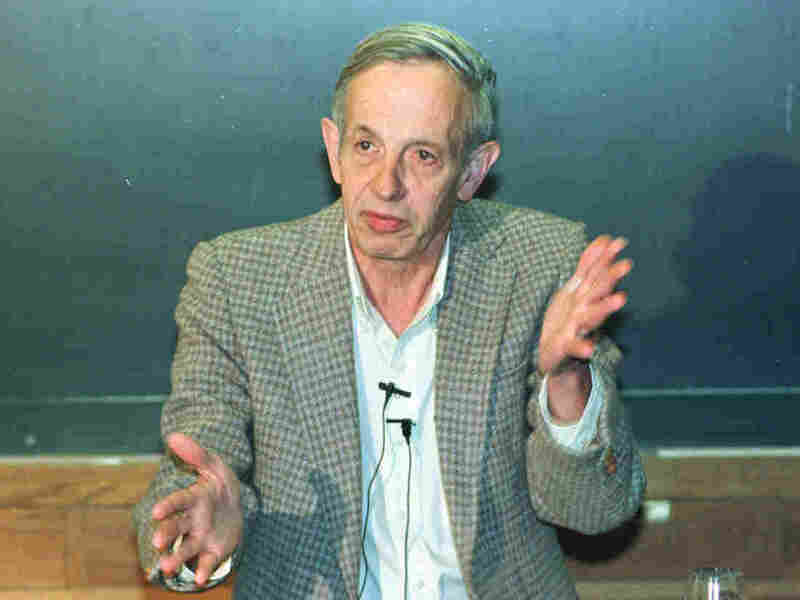 'Beautiful Mind' Mathematician John Nash Jr. Dies In New Jersey Car Crash : The Two-Way The Nobel Prize winner, who struggled with schizophrenia and was portrayed by Russell Crowe in the 2001 film, died with his wife in a taxi on the New Jersey Turnpike, officials say. He was 86. Princeton University professor John Nash speaks during a news conference at the university in Oct. 1994 after being named the winner of the Nobel Prize for economics. John Forbes Nash Jr., the Nobel laureate known for his groundbreaking work on game theory and differential equations, was killed along with his wife in a taxi crash on the New Jersey Turnpike, police say. He was 86. His death was first reported by NJ.com citing a police official. NPR has confirmed the report through longtime colleague Louis Nirenberg. The couple were killed on Saturday. Nash is best known to the general public as the subject of the 2001 film A Beautiful Mind, which depicted the troubled mathematician struggling with paranoid schizophrenia even as he pressed ahead with his research. Nash was played by actor Russell Crowe. "[Were] in a taxi traveling southbound in the left lane of the New Jersey Turnpike, State Police Sgt. Gregory Williams said. The driver of the Ford Crown Victoria lost control as he tried to pass a Chrysler in the center lane, crashing into a guard rail. "The Nashes were ejected from the car, Williams said. "'It doesn't appear that they were wearing seatbelts,' he said." Nirenberg, with whom Nash shared the 2015 Abel Prize, tells NPR's Lauren Hodges that he and his colleague had just returned from Oslo where they received the award. Nirenberg said Nash and his wife were supposed to take a limo home but the driver never showed. So, instead, they took a cab. Princeton President Christopher L. Eisgruber later issued a statement saying the university was "stunned and saddened by news of the untimely passing of John Nash and his wife and great champion, Alicia." "John's remarkable achievements inspired generations of mathematicians, economists and scientists," Eisgruber said. A bio on Princeton University's website, where Nash was a professor, notes that A Beautiful Mind was "loosely" based on his life. Nash received his doctorate from the institution in 1950. "The impact of his 27 page dissertation on the fields of mathematics and economics was tremendous. In 1951 he joined the faculty of the Massachusetts Institute of Technology in Cambridge. His battle with schizophrenia began around 1958, and the struggle with this illness would continue for much of his life. Nash eventually returned to the community of Princeton." In a 2004 interview with Nash published on the website of the Nobel Prize, the mathematician was asked how receiving the prestigious award had changed his life. "It has had a tremendous impact on my life, more than on the life of most Prize winners because I was in an unusual situation. I was unemployed at the time," he said. "I was in good health, but I had reached the age of 66 and beginning to get social security, but I didn't have much of that," Nash said. "I had many years of unemployment before me. And so I was in a position to be very much influenced by [how] the recognition of my earlier work came about in this way." Although Nash shared the Nobel Prize in Economics in 1994 for his work "non-cooperative games" (game theory), the Abel Prize from the Norwegian Academy of Science and Letters announced in March was in recognition of "his seminal work in partial differential equations — which are used to describe the basic laws of scientific phenomena." Nash was in Oslo on Tuesday to receive it, along with Nirenberg, from King Harald V.
NJ.com says that wife Alicia "was his caretaker while he battled his mental illness. They became mental health care advocates when their son John was also diagnosed with schizophrenia."